...if you tell me yours! From many years experience I know that ny resolutions pretty much mean January Resolutions as they rarely make it into February (that's me anyway, you might be 'gooder' than I am). So this year I thought I'd try something different. I'm going to set myself a minimum of 3 goals at the beginning of each month. And now I've told you about them I'm hoping that's extra incentive to keep at it! 1. 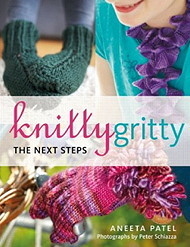 Go through Knitty Gritty - The Next Steps with a fine-toothed comb for any final amendments. I'm allowed to make basic text changes to the book before it's reprinted for the first time later this year. It know from the first book that no matter how hard I work, some typos/errors will slip through the next (as is true in any situation where several people work on a project) but that doesn't make it any less painful! It's a hard job as I don't consider myself a good proof-reader, but at the final reckoning it's something that only I can do so I'm going to set myself the goal of getting it done this month. I'll keep you updated here and on the errrata page for The Next Steps. 2. Learn one knitting technique that I don't know (and am always afraid a student will ask me!) It's hard for me to admit this, but I wouldn't be a good teacher if I didn't...but I don't know everything!!! Why should I? After all I'm not God eh? : ) But I know I don't push myself enough and if I'm not worried about knowing everything, I am keen to be the best knitting teacher I can be so I'm going to set myself one knitting challenge each month. January's is 'provisional cast on'. 3. Cooking! I'm a good enough cook, but unadventurous. My Mum is the Best Cook in the World, but, bless her, a terrible teacher so trying to get a recipe out of her is like blood out of a stone. If I taught like her I'd be looking for a new career by now ; ) This is going to be a regulary monthly challenge for 2013. January's is 'thepla' which is a savoury, shallow fried flat bread made using leftover rice. Delicious with yogurt. Keep your fingers crossed that I keep up with my good intentions! 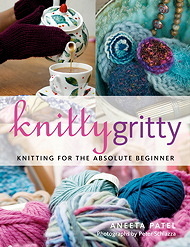 Watch this space for more news and do send me your own ny resolutions whether they are knitting or non-knitting related.